Fresh install from the live-cd (Daily build Xubuntu 14.04 - 32 bit). My location was determined as Brussels (which is correct). Locale is set to Deutsch ??? Same bug here, also installed in Belgium, Brussels. @Olivier - Which installation media did you use? Was it 14.04 or 14.10? If it was 14.04 was it the 14.04 point release? Same issue here, Ubuntu 14.04.1 x86_64 fresh install from a live usb a few days ago. During install I chose to install the system in English, with the “French (Bépo)” keyboard. I'm also located in Brussels, Belgium. Everything is in English and the keyboard mapping is correct. However the dates are in German for the login screen, the application and the date command. I changed everything to en_BE (not sure whether that's actually valid…) but it is not effective yet, even in new gnome-terminal. I'll reboot later today to see. In the end I changed everything to en_GB and the dates are now displayed correctly. However, gnome-language-selector still suggests me to install the DE packages for an unknown reason. Installed a brand new Kubuntu 15.04, choosing English as language and Belgium as my country. As a result, I get a very unnice de_BE.UTF-8 as my language. Note that this problem exists also in 14.04.2 LTS and 14.10, whatever the *buntu flavor you choose (also seen in Lubuntu and Xubuntu). This is a problem in the locale generation mechanism, not in a KDE or Gnome specific tool. Could it be related to the fact that en_BE is not defined in /usr/share/i18n/locales/ ? But then, why does it default to de_BE ?! Confirming that this bug still affects 14.04.2 LTS, tested trough clean install with location setting to Brussels. result is a semi german interface => unexpected behaviour. > Fresh install from the live-cd (Daily build Xubuntu 14.04 - 32 bit). > My location was determined as Brussels (which is correct). > Locale is set to Deutsch ??? Bug is still present in 16.04 with a fresh install. Almost 4 years after the first report, this bug is still present. Fresh install from Ubuntu-MATE 17.10. During installation, chosen language: English, location: Brussels. All the menus are in English, but date and time are in German. It can be solved by the user going to "Language support > Regional Format". According to user ikonia on IRC, this bug is the same on Debian, so we need to find the identical bug in Debian and see if it's being worked on there. According to https://wiki.ubuntu.com/DebuggingUbiquity#Notes, this bug should be tagged with "ubi-language". So where does one set tags on a bug? By the way, confirming that the bug is still present in Ubuntu 17.10. Ubuntu 18.04, still the same. It looks like Germany won the war after all, at least for people living in Belgium. 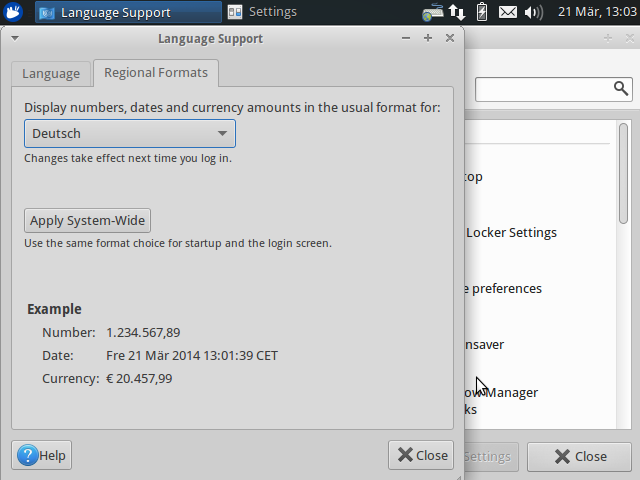 I can confirm that 18.04 LTS still does not know the difference between Dutch and Deutch. Language format in gnome-control-center is shown as "Belgien" (German word for Belgium). Regional formats shows "Deutsch" (German, in German), expected: "Nederlands" (Dutch, in Dutch). (pressed Enter too fast) and the Regional format can't be changed there. Just noticed this bug report. It's not a bug. You don't explicitly set the regional format in the installer, but the installer 'guesses' that setting based on the time zone location. So if you state Brussels for time zone, it seems to pick the de_BE.UTF-8 locale. 2. Select Dutch as the region. Lol, 'this is not a bug'. The installer clearly guesses wrong, only 1% in Brussels speaks German. I want my installation in English but with the Belgian locale. @gunnarhj, "guessing" a locale should not use a locale used only by a very small percentage of people in Belgium. From the format I'm going to assume it's picking the first locale it can find? @OliWare: You get a Belgian locale, just not the one you want. @Jonas: I assume the same. We can't remove a locale for this reason; we have the locales provided by glibc. But I suppose that the installer (ubiquity/localechooser) could be tweaked to 'guess better'. That would require some hard coded information about most common language in countries with multiple languages. Re-opening the ubiquity task. impossible to obtain... For once, Windows does it better with this regard. > @OliWare: You get a Belgian locale, just not the one you want. > have the locales provided by glibc. > languages. Re-opening the ubiquity task. 1) I suppose that those responsible for the design of the installer want to keep it simple. But, as I explained in comment #27, you can choose afterwards. 2) That would be quite a different approach to locale handling. A huge project. A choice would indeed be nice, if there's more than one official languages for the location.